Please do not place a request until you have funds in your ClassWish account. 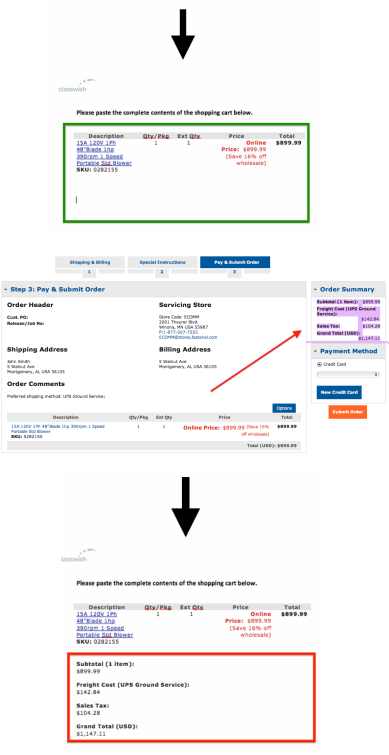 You will shop on the Fastenal site to assemble an order, but you will not place your order with them. Rather, you will assemble the order on their site by adding items to the cart, and you will then email the cart to ClassWish for us to place the order. Please follow these easy directions. When you have funds in your ClassWish account (or are about to add your own funds), go to http://www.fastenal.com/. (To see other vendors for other categories, please go to the home page of this ClassWish-Vendors site). Shop like you normally would; simply add items to your cart on the Fastenal website. Click "My Cart" at the top right corner of the site to proceed to checkout. Review your items and click the orange "Checkout" button. Checkout as a guest, or sign in with your personal account. Step 1: Billing & Shipping - We can only ship to your school (not to your home), so please use your school address info in this section. Under "Shipping Method" please choose the "UPS Ground Service" option. Click "Next Step." Step 2: Special Instructions - You may disregard this step and click "Next Step." Step 3: Pay & Submit Order - You do not have to do anything on this page. Disregard the entire "Payment Method" section at the right bottom corner (crossed out in red in the image to the right). Do NOT provide your credit card information. You are only using the Fastenal site to assemble the order, not to place it. Please do not take any further steps on the Fastenal site, but keep the current page open as you will need the cart and order summary a bit later. Go back to the Fastenal checkout page, which you are still on. First, highlight the items in your cart at the bottom of the page, like we did with the blue highliter in the image to the right. Be sure to include all the items in your cart as well as their prices. Copy and paste this into the second page of the Request Form as shown in the image to the right, boxed in green. Next, go back to the Fastenal page and highlight the contents of the "Order Summary" as we did with the purple highlighter in the image to the right. Make sure to include the shipping fee, tax, and total price. (Do not do a screen grab). Copy and paste everything into the same page of the Request Form under your cart items, like we did in the image to the right, boxed in red. So long as you have enough funds in your ClassWish account, we will deduct the order amount and pay Fastenal. Fastenal will ship the items to you at your school.